Cucumbers can be grown 6-8 inches long. It loves full sun and loamy fertilized soil and grow from vein that can be hanged through support. Green cucumber is also popular for juice and some wonderful health benefits such as fights inflammation, protects brain, helps in cancer, antioxidant properties, manage stress, supports digestion and heart health. 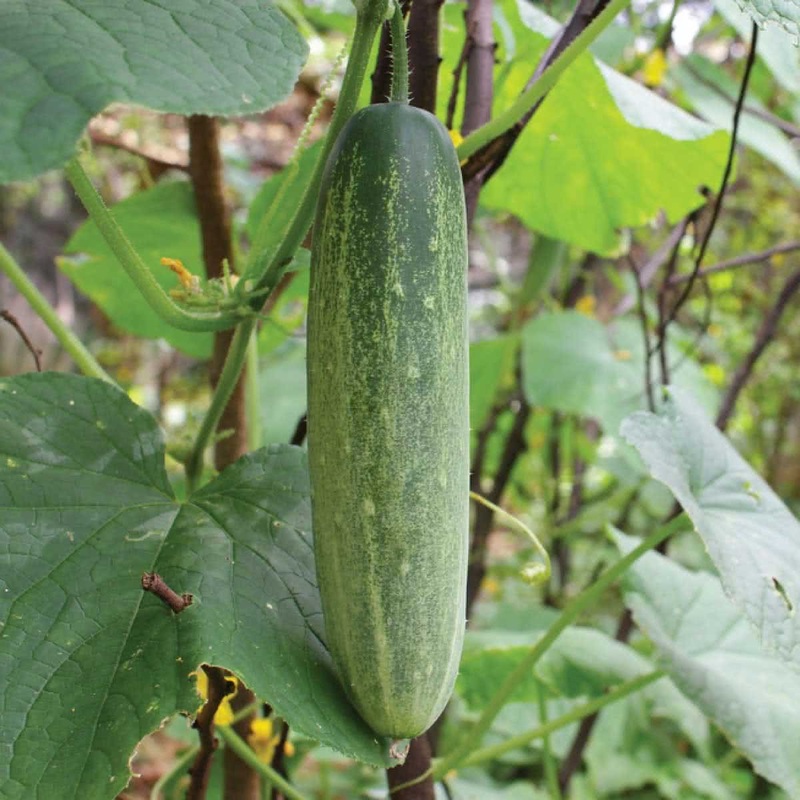 Introduction and Uses: Green Cucumber (Long) also known as the yard-long cucumber, snake cucumber, and URI in Japan is a slender fruit which closely resembles cucumber. You should not confuse it with the snake gourds (Trichosanthes spp.). The skin of this particular fruit is very thin, light greenish, and bumpless. It is not bitter and is often used without peeling. Botanical Name: Cucumis melo var. Flexuosus. Sprouting Stage:Seeds will germinate within first 6-8 days or so & tiny sprouts will be visible. Sunlight:Cucumber plants require full sunlight. Therefore your raised bed should be made at a bright sunny spot. Keep the Cucumber container under open sunlight. Watering technique: Water your potted Cucumber plant every day in summer. Water the soil near the plant. Use a watering can to make sure that the plants get water in the form of the shower & not by a single flow. You can also make provision for watering by watering by drip irrigation system for your raised beds. 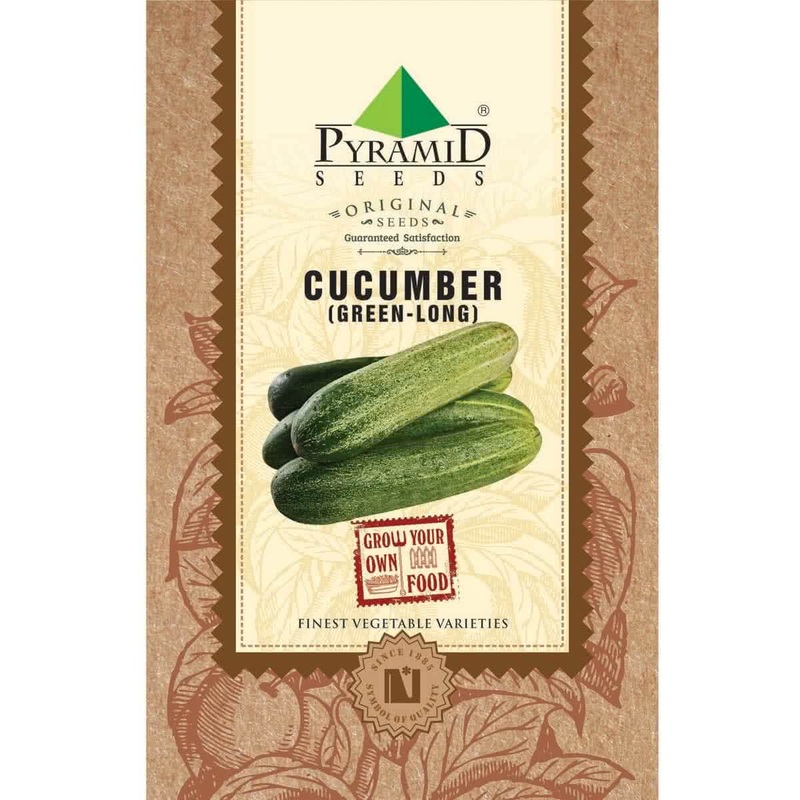 Top Dressing: When your Cucumber climber is more than 45 days old, Provide one tablespoon of 15:15:15 (NPK) fertilizer per plant or mix handful of Vermicompost in the soil around each plant. Plant care: Always look for the early signs of any insect/fungal/ any other infections. Spay appropriate medicines as soon as any symptoms of such diseases are spotted. Watch out for Powdery Mildew when plants are young. Note: Cucumber plants have separate Male & female flowers on the same plant. Fruits will be formed on female flower after pollination. Hand pollination of flowers: Take ‘pollens’ from male flowers on painting brush or cotton bud & dust them on ‘stigma’ of female flowers. This will increase overall production of Cucumbers. This step is not mandatory. Harvesting: (40 to 50 days from sowing) Cucumber climber will start flowering in second month. You can start harvesting raw cucumber fruits after 40-50 days of seed sowing. Harvesting season can continue for next 3 months. Approx. 45 to 50 Seeds in 1.2 gm, 923 to 1025 Seeds in 25 gm, 3690 to 4100 Seeds in 100 gm, 9225 to 10250 Seeds in 250 gm. Very good germination ratio, and Nice cucumbers. Really i loved it. Very good seeds. I had 20 plants and lots of fruit. Could pick one fruit every 2nd day this whole summer. Its nice big cucumber n very tasty.